1. At the Denver Broncos game this past Sunday, frequent announcements during the breaks in the action of various sorts of military heroes recently returned (or still in) Afghanistan, with much applause; also, country music with pro-military, pro-US themes. And of course a flyover by Air Force jets at the conclusion of the National Anthem, which was sung as representatives of the various US armed services (Coast Guard included, natch) stood at attention on the field. 3. 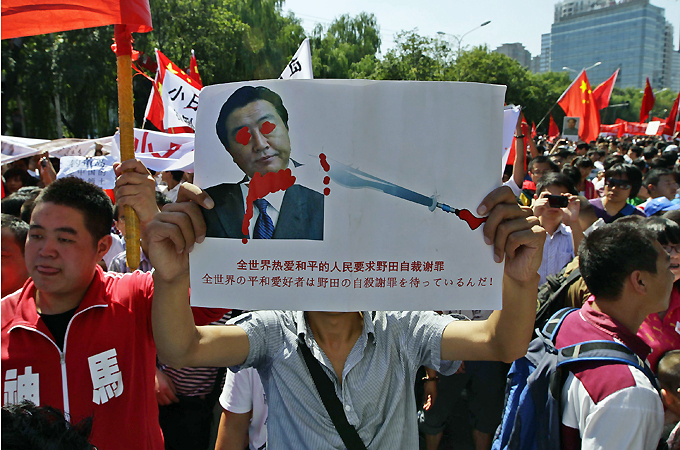 The outpouring of anti-Japanese sentiment in recent days in China, which includes a variety of amusing and not-so-amusing instances of what strike me as purely “cultural” and actively imagined/imaginary response whose aesthetic dimensions exceed (however slightly) their political ones. Key here would be to think about how the complex identified differs from the military-industrial complex; though obviously they’re almost entirely integrated it would be nice to figure out where they diverge–where, for instance, the values and norms (or even political positions) associated with the m-c complex would lead to resistance to warmongering or support for cuts in national defense budget. Not sure if that can happen.